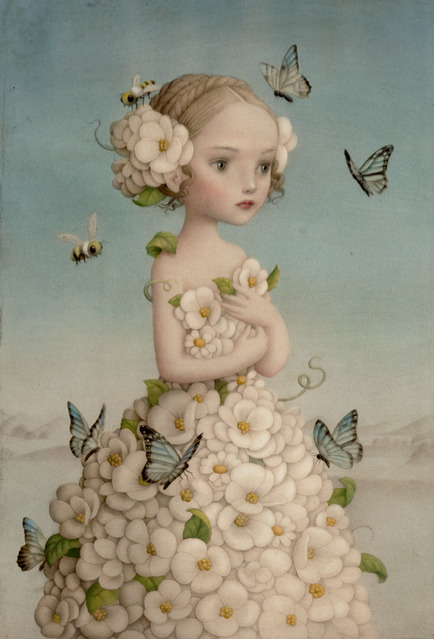 AFA Gallery presents a new collection of work by Nicoletta Ceccoli. The exhibition will feature new paintings and limited edition prints. This is Ceccoli’s third solo show at AFA. The Uncanny is a psychological enigma that inspired Ceccoli in her newest collection of work. Her exploration of what is at once profoundly beautiful becomes immediately unfamiliar, resulting in a feeling of intellectual uncertainty and discomfort. The friction between beauty and innocence and what is dark or sexually deviant is a place of such instability that the mind reels from imagining feeling joy and being emotionally broken simultaneously. Nicoletta Ceccoli was born in San Marino, Italy, graduating from the Institute of Art in Urbino, where she attended classes within the ducal palace, studying animation cinema. Throughout her career, Ceccoli has been praised for her work, being awarded the Andersen Prize for Best Italian Illustrator of the Year, in addition to a silver medal from the Society of Illustrators in New York. She is also a four time recipient of the ‘Award of Excellence’ from Communication Arts and her art has been exhibited at the Bologna Children’s Book fair seven times. Internationally acclaimed, Ceccoli has exhibited her work in the UK, Canada, USA and Italy.